Abu Dhabi Ports announced today the signing of a container terminal concession agreement with COSCO SHIPPING Ports Limited – Abu Dhabi (CSPL SPV), a wholly-owned subsidiary of COSCO SHIPPING Ports Limited, one of the leading container terminal operators in the world and a subsidiary of China COSCO SHIPPING Corporation Limited. The event was held in the presence of His Excellency Dr. Sultan Ahmed Al Jaber, the UAE Minister of State and Chairman of Abu Dhabi Ports, Mr. Zheng Chiping, Deputy Director of the foreign investment department of the National Development and Reform Commission of PRC and Mr. Wan Min, President of China COSCO Shipping Corporation Limited. Captain Mohamed Juma Al Shamisi, CEO of Abu Dhabi Ports and Zhang Wei, Vice Chairman and Managing Director of COSCO SHIPPING Ports Limited signed the agreement today, ushering a new prosperous journey of Abu Dhabi Ports, in line with the progressive aspirations of Abu Dhabi Vision 2030 for a more diversified economy. Infrastructure Development; His Excellency Staff Major General Pilot Faris Khalaf Khalfan Al Mazrouei, Chairman of Critical Infrastructure & Coastal Protection Authority, and Mr. Lin Yaduo, Chargé d’affaires ad interim of the Chinese Embassy in the UAE, among other senior officials from both entities. TEUs. The agreement includes the option for a further 600 metre of quay length in the future to allow for anticipated volume growth, the nominal annual handling capacity will increase to 3.5 million TEUs when all phases are complete, creating a new overall annual capacity of up to 6 million TEUs. The global port operator giant is establishing a joint venture company in 2016 to operate the new Khalifa Port Container Terminal 2 in Khalifa Port, one of the world’s fastest growing container ports and a leading hub for the Middle East, Africa and South Asia (MEASA) region. As per the agreement, the joint venture company will be entitled concession rights of Khalifa Port Container Terminal 2 for a span of 35 years, with a renewable period of 5 additional years. CSPL SPV will have the controlling stake in the joint venture company. 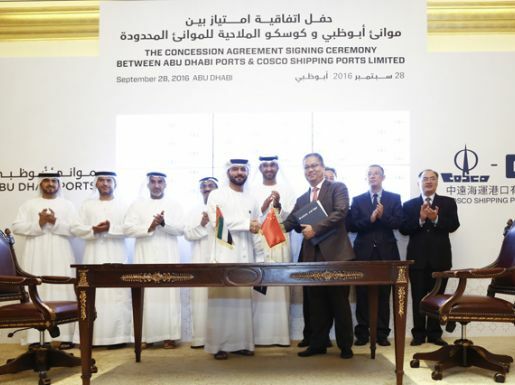 “The signing of the concession agreement between Abu Dhabi Ports Company and COSCO Shipping Ports Limited will significantly expand trade between China, the UAE and the broader region. It will greatly enhance the UAE and Abu Dhabi’s role as a key logistics and trading hub, between East and West and will also serve to further diversify the UAE’s dynamic and growing economy,” said H.E Dr. Sultan Ahmed Al Jaber, UAE Minister of State and Chairman of ADPorts. Besides Khalifa Port, COSCO SHIPPING Ports Limited operates a global network of 46 terminals and 169 berths across mainland China, Hong Kong, Taiwan, Korea, Singapore, Greece, Turkey, Egypt, Belgium and the United States . Building on COSCO SHIPPING Ports’ successful operations at Khalifa Port, the agreement aims to further boost economic ties and bilateral trade between the two countries. Khalifa Port Container Terminal 2 is located along the “Silk Road Economic Belt and the 21st Century Maritime Silk Road” and the shipping hub of West Asia region. 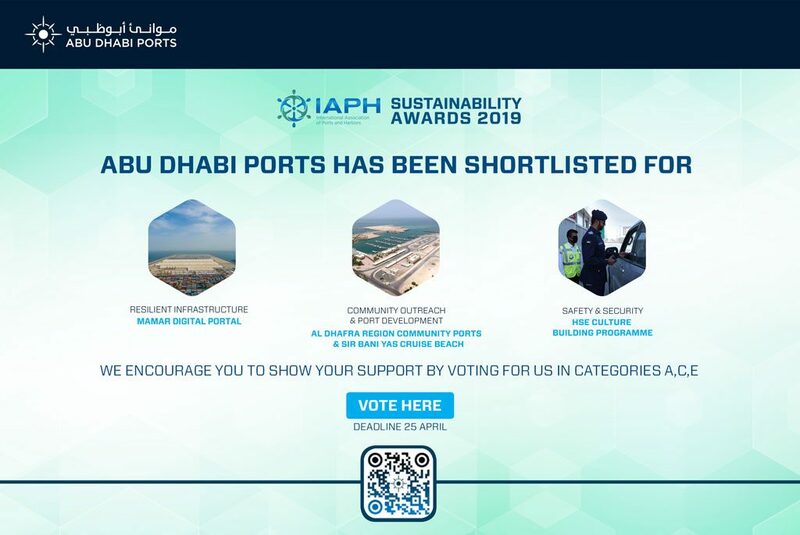 Khalifa Port, is the major container gateway port of Abu Dhabi and is strategically situated between Abu Dhabi and Dubai with excellent hinterland connections and geographic location. The expansion of the quay wall is part of the broader developments at the Khalifa Port, which include an innovative new terminal booking, tracking and transaction system for sea and land based users, advanced RoRo facilities, new liner calls, the development of a regional liner hub and transhipment business to South Asia, as well as the addition of approximately 14.5 million square metres now leased in the adjacent Khalifa Industrial Zone (KIZAD). Such developments and agreements continue to take Abu Dhabi Ports to the next level as a maritime trade gateway to the world’s fastest growing economies.